There is probably more poetry about birds than about any other insect or animal, as if there’s something in the nature of a bird that makes it particularly suited to the small and intense space that is a poem. This delightful anthology is a second edition of one of our most popular titles and includes some beautiful new poems. It opens up a captivating world that exists in parallel to our own and will be relished by birders and poetry lovers alike. The ten selections are little miracles in themselves, capturing the quirks of habit or appearance that distinguish one species from another. Never anthropomorphic, they imagine what the vivid life of a bird must be, or tease out what it is that thrills or moves us when we’re surprised by a bird as we hurry about our lives. 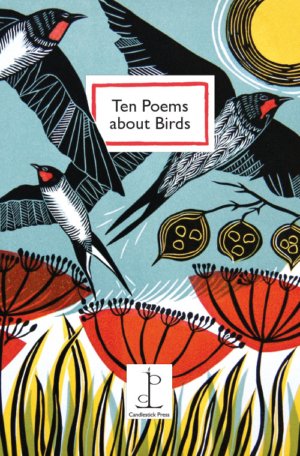 Poems by Elizabeth Bishop, John Clare, Emily Dickinson, Paul Farley, Rebecca Goss, Kathleen Jamie, Michael Longley, George MacBeth, Katrina Porteous and Lynne Wycherley. Cover illustration by Cathy King. Donation to The Owls Trust. Ten poems about cats, capturing their amusing and endearing ways. The canine and poetry worlds meet at last - "It's such a relief to find wonderful poems like these..." Dame Jenni Murray, broadcaster and author. A dozen poems about the quirks and curiosities of chickens, for the friends in our lives who have succumbed to their charms. Candlestick Press Ltd. Registered in England No. 6667297. Registered Office: Diversity House, 72 Nottingham Road, Arnold, Nottingham NG5 6LF.